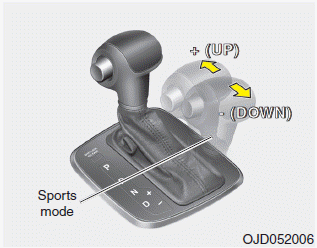 Do not drive with the shift lever in N (Neutral). The engine brake will not work and lead to an accident. Before parking in [N] (Neutral) gear, first make sure the parking ground is level and flat. Do not park in [N] gear on any slopes or gradients. If parked and left in [N], the vehicle may move and cause serious damage and injury. For EPB (Electronic Parking Brake) equipped vehicles with [AUTO HOLD] function used while driving, if the ignition button has been turned [OFF], the electronic parking brake will be engaged automatically. Therefore, [AUTO HOLD] function should be turned off before the ignition button is turned off. For extra power when passing another vehicle or climbing grades, depress the accelerator pedal fully (more than 80%) until the kick down mechanism works with a clicking noise, at which time the transaxle will automatically downshift to the next lower gear.